Brussels: Europe’s economy will rebound next year from a deep slump and accelerate in 2011, the European Commission said on Tuesday, paving the way for major budget deficit cuts across the 27-nation bloc from 2011 at the latest. The European Union’s executive arm forecast that the EU economy would expand by 0.7% in 2010 and 1.6% in 2011, after a contraction of 4.1% this year. In the 16-country euro zone, growth would be 0.7% next year and 1.5% in 2011, after a 4% fall in 2009. This is a strong upward revision from its forecast on 4 May, when the Commission projected the euro zone to contract by 0.1% in 2010. EU finance ministers had agreed on 20 October and EU leaders backed them on 30 October that if the Commission forecasts showed the recovery was strengthening and self-sustaining, deficit cuts in all EU countries should start in 2011 at the latest. “With this forecast, I will recommend to Ecofin (EU finance) ministers next week to declare or confirm that 2011 is the year when the EU and euro area start in aggregate terms this fiscal exit strategy," economic and monetary affairs commissioner Joaquin Almunia told a news conference. He said the economy was coming out of recession thanks to government and central bank support measures and urged all the announced steps should be still implemented. 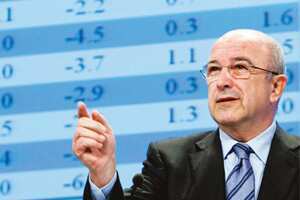 Almunia also said banks had to be repaired to make the recovery sustainable. In its forecasts, the Commission quoted an estimate by the Committee of European Bank Supervisors from 1 October, which said that future potential losses due to write-downs on loans and securities for euro area banks for 2009 and 2010 were in the range of some €200-400 billion (around Rs14-28 trillion). Ahead of a European Central Bank (ECB) policy meeting this week, the forecasts compared with ECB’s last forecast on 3 September for a change in euro zone GDP (gross domestic product) of between -4.4% and -3.8% this year and -0.5% to +0.9% in 2010. The Commission said the euro zone emerged from recession in the third quarter with quarterly growth of 0.5%, a rate likely to slow to 0.2% in the fourth quarter. The first half of 2010 is likely to be a “soft patch" as temporary factors now boosting growth, such as inventory rebuilding, peter out. This is likely to slow euro zone quarterly growth to 0.1% in the first two quarters of next year, the Commission said, before it returns to 0.5% quarterly growth in the second quarter of 2011. The bloc’s finance ministers had agreed last month that, while differences in country situations should be taken into account, a number of countries should start cutting earlier than 2011 and most should cut by at least 0.5% of GDP a year. Shoring up public finances is important to retain the confidence of markets and consumers in government policies after the worst economic downturn since World War II inflated budget deficits in many countries to unsustainable proportions. In the twice-yearly economic forecasts, the Commission said that unless policies changed, the aggregate budget deficit in the euro zone would reach 6.9% next year and 6.5% in 2011, from 6.4% seen this year. This is more than twice the EU limit on budget deficits of 3% of GDP. Euro zone debt is likely to soar to 84% of GDP in 2010, from 78.2% seen this year and to 88.2% of GDP in 2011. Finance ministers will discuss the Commission’s forecasts and their implications for deficit-cutting next week and the Commission will propose deadlines for bringing down the deficits of some of the countries. The ministers are wary of withdrawing state support to the economy too early so as not to cripple the nascent recovery. The Commission forecast unemployment in the euro zone would reach 10.7% of the workforce in 2010 and 10.9% in 2011, up from 9.5% seen this year. After a dramatic fall of 17.9% seen this year, investment would continue to shrink next year by 1.3% in the euro zone and start growing by 4.1% in 2011. The recovery in 2010 and 2011 is expected to be accompanied by inflation well below the ECB target of just under 2%, underlining market expectations the central bank will not raise interest rates from record lows of 1% until late 2010. The Commission expects inflation in the euro zone to be 1.1% next year against 0.3% seen this year and 1.5% in 2011. ECB had forecast on 3 September that inflation in 2009 would be between 0.2% and 0.6% and in 2010 between 0.8% and 1.6%.